Japan develops first Electric car. OMG got to catch that pikachu! Poke'Car Gonna buy them all!! so when you have road-rage it evolves? Dude, look at those rims! OH YES! damn... (shuffles) where did I put my pokeball! 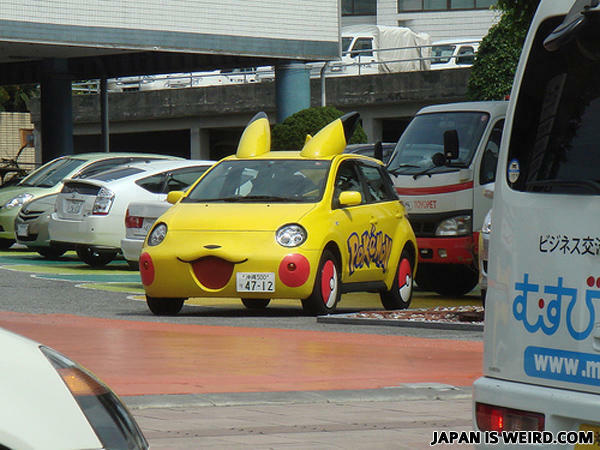 Quick to the Pikachumobile !!! i want!!!!!! 83 im a huge manga fan!!! damnit! I want a mew! If this was 1997 I woulda killed to drive this to school!! gotta catch em all!! this is fawkin awesome whoeva created it! God bless ur heart and mind. This is what happens when you combine Pokemon and Transformers. I actually own that car, it's a remote controlled vehicle that came out in like the 1990's. Driving in high traffic *Honks the car horn. * an people hear a loud cry of "Pikachu!"